Who am I? 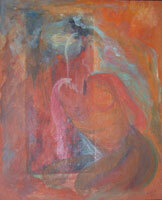 A painting that started as an abstract with layers of colour to create transparency….A mirror-like area was created onto which a live-model dual-pose was painted. Autumn Repose, acrylic on canvas, 40 cm x 50 cm. Depicts a woman with flowers imprinted over her whole body, languid in an autumn scene. 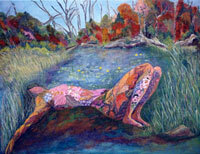 She is lying, covered in colourful blossoms, seemingly inert, surrounded by a lily pond, marsh weeds, and trees crowned with turning leaves. This is Post-Menopause – the autumn of womanhood… a season of withdrawal. The blemishes on her body signify life experiences, rendering each age spot and wrinkle beautiful as the autumn season, when plants store nutrients and toughen up to survive winter. Life seems to stand still, yielding to nature while gathering strength for the next cycle. 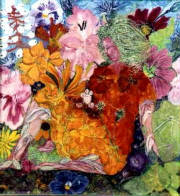 This painting depicts a woman seated, merged into a bed of autumn flowers, locked serene and sheltered by her life experiences. The veins on her legs mark her age...the radiant colourful flowers she is dressed in provide a harmonious witness to her maturity. It is the beginning of Menopause… However, the body contains a woman (still young-at-heart) and the courageous flowers that are still in bloom in autumn are the last hurrah of summer. They strive to preserve the beauty and vibrancy of summertime at a halt.